Now, for the record, we have never used these kinds of products in our house - I just can't seem to bring myself to pay $7 or more (depending on where you live) for a tiny little product like this. 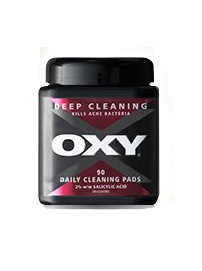 No offense to OXY Daily Cleaning Pads, I'm sure you work great. Place the distilled water and tea tree oil in a small jar, close lid and mix well. Add the cotton make up remover pads (make sure that they get saturated). Oh thanks Becky! Josh does use these and I have Tea Tree Oil in the medicine cabinet so it will be easy to make up the recipe and add it to his empty jar. thanks! Lori D.